This oil has a distinctive pungent taste, characteristic of all plants in the mustard (Brassicaceae) family (for example, cabbage, cauliflower, turnip, radish, horseradish, or wasabi). 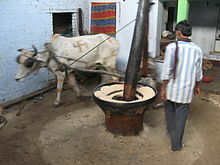 It is often used for cooking in North India, Eastern India, Nepal, Bangladesh, and Pakistan. In Bengal, Orissa, Assam, Meghalaya, Manipur, and Nepal, it is the traditionally preferred oil for cooking. The oil makes up about 30% of the mustard seeds. It can be produced from black mustard (Brassica nigra), brown Indian mustard (B. juncea), and white mustard (B. hirta). Mustard oil has high levels of both alpha-linolenic acid and erucic acid. Based on studies done on laboratory animals in the early 1970s, erucic acid appears to have toxic effects on the heart at high enough doses. While no negative health effects of any exposure to erucic acid have been documented in humans, publication of those studies led to governments worldwide moving away from oils with high levels of erucic acid, and tolerance levels for human exposure to erucic acid have been established based on the animal studies. Mustard oil is not allowed to be imported or sold in the U.S. for use in cooking, due to its high erucic acid content. Because of the contained allyl isothiocyanate, this type of mustard oil is toxic and irritates the skin and mucous membranes. In very small amounts, it is often used by the food industry for flavoring. In northern Italy, for instance, it is used in the fruit condiment called mostarda. It is also used to repel cats and dogs. It will also denature alcohol, making it unfit for human consumption, thus avoiding the taxes collected on alcoholic beverages. Used as traditional jaggo pot fuel in Punjabi, Bengali and many other weddings in different parts of India. Used as part of home-made cosmetics during the pre-wedding ceremonies called mayian. Used in musical instruments. The residue cake from the mustard oil pressing is mixed with sand, mustard oil and (sometimes) tar. The resulting sticky mixture is then smeared on the inside of dholak and dholki membranes to add weight (from underneath) to the bass membrane. This enables the typical Indian drum glissando sound, created by rubbing the heel of the hand over it. This is also known as a tel masala, dholak masala or oil syahi. ^ Rastogi T, Reddy KS, Vaz M, et al. (April 2004). “Diet and risk of ischemic heart disease in India”. Am. J. Clin. Nutr. 79 (4): 582–92. doi:10.1093/ajcn/79.4.582. PMID 15051601. ^ “Welcome to the USDA Food Composition Database”. www.nal.usda.gov. Retrieved 13 April 2018. ^ “Mustard”. A Guide to Medicinal and Aromatic Plants. Center for New Crops and Plant Products, Purdue University. Retrieved 3 January 2009. ^ “Mustard Oil, Synthetic”. JT Baker. Retrieved 3 March 2010. Tanuja Rastogi; Reddy, KS; Vaz, M; Spiegelman, D; Prabhakaran, D; Willett, WC; Stampfer, MJ; Ascherio, A (2004). “Diet and risk of ischemic heart disease in India”. American Journal of Clinical Nutrition. 79 (4): 582–592. doi:10.1093/ajcn/79.4.582. PMID 15051601.